2	. What is capital and why tax it? Taxing capital is a key way to maintain and increase the progressivity in the U.S. tax system and raise the revenue needed to support government activities and investments that in turn will help ensure strong and sustainable economic growth. Why turn to capital as a source of government revenue? Taxing capital is a highly progressive form of taxation that research suggests does not seriously affect the rate of savings among high-income Americans—an important consideration in terms of encouraging future economic growth—and is a key part of optimal taxation in the United States. Yet the federal tax rate paid on capital income is, on average, relatively low, due to a combination of factors including low existing rates, special tax breaks, and the gaming of the system to avoid paying taxes on capital. Effectively defending and expanding the taxation of capital will involve significant reform. Specifically, the United States currently taxes capital income using tools that are too easy to avoid. As a result, simply increasing tax rates, whether on capital gains, corporations, or on wealthy estates, will not be successful at generating much additional revenue or significantly improving the progressivity of the tax system. Instead, tax reform should focus on ways of making taxes harder to avoid by owners of capital and possibly by adding additional tax tools as ways of more effectively taxing capital. Absent reforms along these lines, it will be very difficult to expand or even maintain the current system for taxing capital in the United States. These three areas for the reform of capital taxation are not meant to be fully comprehensive but rather zero in on some of the main challenges in taxing capital and the policy instruments that should be deployed in response. Enacting these reforms would strengthen the progressivity of the U.S. tax code, help reduce income inequality, and enable the country to invest in future economic growth and stability. What is capital and why tax it? This report focuses on the major challenges that this country faces in trying to tax capital and how to address those challenges in order to encourage stronger and more equitable economic growth. But before reaching those questions, this section briefly reviews what capital is, why it should be taxed, and why multiple instruments for doing so are appropriate. There are a few important characteristics of capital relevant to this report and to the question addressed in the next section of why we tax capital. One is that the ownership of capital and the income derived from capital is highly concentrated. A second is that it can be hard to distinguish between capital and the returns to capital, and accrued earnings from labor. The estimates showing the concentration of income also underscore how hard it is to distinguish between capital, returns on capital, and accrued earnings from labor. Figure 1 assigns all employees’ wage earnings to “clearly labor.” But other categories of income are a mixture. For instance, business income can reflect some combination of returns to an owner’s capital investments and the labor of the owner. Further, the value of that business—which is a form of capital—may reflect both capital investments that have been made and the labor that has been invested. What’s more, if the business were sold, then the gain could be a combination of the returns on labor and capital because part of the business’s value may reflect the owner’s labor put into the firm. Finally, sophisticated high earners, especially those who mix labor with capital in the form of property, can sometimes convert labor income into capital gains. There is a long-standing debate as to whether to tax capital and the returns to capital. Some suggest that not taxing such returns—or at least the “ordinary” returns to capital that are broadly available to market participants—is optimal according to traditional economic models that trade-off between efficiency and equity. They argue for achieving a progressive tax system by focusing taxation on labor and “extraordinary” returns to capital (above market returns that are sometimes called “rents”)—the extraordinary returns on certain investments that derive from luck, market power, or other factors (such as returns on an early investment in the stock of Microsoft Corp.). But there are convincing arguments in favor of taxing capital and the returns to capital, and at rates higher than we do now. Taxing capital is an effective way—and perhaps the best way (in combination with other taxes)—of efficiently and fairly taxing the highest income earners in the United States. All of these reasons underpin the ultimate goal of higher capital taxation—to ensure federal tax revenues are sufficient to invest in the nation’s long-term economic growth. So let’s examine each of these arguments in turn. In sum, taxing capital, especially of the wealthiest Americans, is a way of achieving highly progressive results but without much additional inefficiency relative to a tax that exempts the ordinary return on capital. Notably, many of the challenges to effectively taxing capital relate to the first two categories of behavioral response— timing and avoidance. Right now, there are too many opportunities in the current tax system to change the timing of taxation to the benefit of the owners of capital and sometimes for them to avoid tax entirely through tax-planning techniques. The models that suggest otherwise—that the ordinary returns on capital should be spared from taxation—rely on a number of assumptions that are not reflective of reality. As Reed College economist Kimberly Clausing summarizes, these unrealistic models tend to assume “infinitely lived households, perfect foresight, perfect capital markets, and so on.”12 These same models also assume that ownership of capital is not a separate indicator of an ability to pay. As noted above, it can be hard to distinguish between capital and labor income. As a result, failing to tax capital income—especially if done through mechanisms such as simply lowering capital gains tax rates—can lead to under-taxation of labor income. Further, this opportunity to reduce taxes by classifying income as a return on capital can generate substantial and wasteful tax planning. Taxing capital is highly progressive, whatever metric is used to measure progressivity. The ownership of capital and the income derived from it disproportionately benefits a relatively small share of the population—a population that has been gaining larger and larger shares of total economic resources in the United States.17 Thus, for policymakers concerned both with growing inequality and the federal government’s need for additional revenue to support key investments and programs, capital taxation is an important tool. Indeed, taxing capital is probably a first-best tool for achieving progressive taxation. But even if it is not, it is a significant lever to pull in the absence of other actions to increase revenue and enhance progressivity. This report suggests reforming multiple tax tools to better tax capital. Among those tools are individual-level income taxation through capital gains, entity-level taxation through the corporate income tax system, and wealth taxation largely through the estate-and-gift tax systems but also potentially through more regularly scheduled taxes on wealth. All of these tools fall largely on capital, but they are not interchangeable. The tools are all focused on capital but in different ways and at different stages. The differences among these tools have at least a few important implications. Third, there are good reasons to use multiple tools, with different structures, to tax capital. As Piketty and Saez argue, this can be justified in terms of traditional economic models, which, as they show, can justify both taxation of bequests and earlier taxation of capital income and wealth itself.21 But it is also justified by the types of tax avoidance that these models do not take into account. This is based on the same logic as one of the justifications offered above for taxing capital income in the first place—namely, that more tax tools are better than fewer tools in reducing tax avoidance. Each of the main tools discussed in this report—taxation of gains on property, taxation at the corporate level, and wealth taxes—prompts tax planning to try to reduce the effects of these taxes. Taxpayers will try to adjust when to realize capital gains, where to report profits, and how to structure an estate or gifts to reduce their value. This kind of gaming justifies the use of multiple tools and not just taxing capital one way—so long as the tools cannot be gamed in the same way and so long as each correlates tax liability with people’s ability to pay.22 Using multiple tools should reduce total gaming by sophisticated taxpayers. Gains on property would represent an even larger share of income for high earners since only some of those gains qualify as capital gains, with other gains on property taxed as ordinary income. Further, this measures only realized gains. Among certain very wealthy individuals, unrealized gains can compose almost the entirety of their economic income—that is, their income taking into account the unrealized appreciation on property. Whatever the size of these gains, simply increasing the tax rate on them will not produce much additional revenue because the taxation of income from the sale of property is undermined by two related aspects of the tax system. First, these gains are taxed only when they are realized and recognized. The definition of realization is technical, but it often occurs when there is a sale of the property. Further, for the income to be included, the gain must be “recognized,” meaning that there is no special exception in the tax law allowing the realized gain to be further deferred. This “realization/recognition” rule makes it relatively easy for a person with gains on property to defer paying tax on those gains. To do so, the person must simply avoid realization and hold onto the property (or take advantage of one of the non-recognition rules). Notably, property owners can borrow using the appreciated property as collateral and even borrow against the appreciation without realizing any gains. This makes deferral even easier. Second, these gains are wiped out upon the death of the owner of the property. This is often called “step up in basis at death” or “step up” for short. The basis of the property—against which gains on property are measured—is set equal to the fair market value of the property at the time of an owner’s death. As a result, any gains earned over the life of the owner of that property are entirely eliminated; those inheriting the property do not have to pay any tax on the previously accrued gain. Should the inheritors sell the property shortly after inheriting it, they would pay tax only on the gains registered since the inheritance. These two policies combine to form a key weakness in the U.S. income tax system. Taxation in the realization-based system is easy to avoid or defer—and deferral reduces the value of the tax to be paid due to the time value of money. Further, and very importantly, if any gains are deferred until death, then they get entirely wiped out. As a result, realization behavior is relatively sensitive to the tax rate; the higher is the tax rate, the greater the incentive to hold property and defer any gains—potentially until the point at which they are entirely eliminated. Even a recent and widely cited success in raising taxes paid by the highest-income Americans illustrates the challenge. In 2013, tax rates for the highest-income Americans rose as parts of the 2001 and 2003 tax cuts expired and increases enacted in the Affordable Care Act came into place. For the top four hundred highest income taxpayers, this resulted in their effective tax rate rising from 16.7 percent to 22.9 percent.25 But there was also evidence of significant tax avoidance. For instance, net capital gains reported on tax returns fell by 20 percent from 2012 to 2013 (and despite 2013 being a banner year for the stock market), as high-income taxpayers shifted timing of realization to try to avoid the tax increase. This was a short-term timing effect, but similar planning can play out over the long-term. Notably, this deferral does not just reduce revenue; it also reduces economic efficiency. This effect is known as “lock in”—as asset holders are “locked in” to their investments relative to what they would otherwise be. This means that people do not liquidate their investments when they might prefer to do so in the absence of tax effects, and assets are not necessarily held by those who would maximize returns on them on a pre-tax basis. Again, this is because the tax system essentially subsidizes those holding the assets to continue doing so—with the subsidy leading to behaviors that reduce economic productivity and growth, with little or no benefit associated with these tax-avoidance strategies. The bottom line is that, without significant reforms, the tax system cannot generate much in additional revenue through taxation of property transactions because it is simply too easy to avoid. Several fundamental reforms could substantially reduce the incentive to defer the realization of gains on property. Most of these kinds of reforms involve some combination of a “mark-to-market” system and a charge for deferring such gains. A mark-to-market system would, on an annual basis, recognize any gains or losses on property. Such a system would fully eliminate any incentive to defer gains since there would no longer be any ability to do so. Some of these problems can be overcome by either combining a mark-to-market system with a charge for deferring gains or just using the deferral charge alone. In that case, those deferring gain are charged for the time value of money but are not made to pay tax on gains on an annual basis. This approach could help solve at least two of the challenges described above. First, the valuation problem could be overcome for assets that are not publicly traded or readily valued by paying a charge for deferring the tax payment, though this comes with certain other downsides. Second, the liquidity problem could be resolved by waiting until the disposition of assets to recognize gains. Tax experts have offered a number of possible models combining mark-to-market and deferral charges. Here are just two examples of promising systems. This style of system is the brainchild of tax lawyer David Miller at the law firm Proskauer Rose.31 Miller recommends applying this only to the most wealthy Americans and largest businesses. For these people and entities, the system would require mark-to-market accounting for publicly traded assets, with tax paid on them on an annual basis. There would then be a deferral charge for other assets to be paid at the point of disposition of the assets—just like under the current system but with an additional charge based on length of holding.32 Such a system would significantly reduce the problem of deferral and would not generate significant challenges in terms of valuation. Furthermore, the wealthiest Americans and largest businesses would be unlikely to face liquidity constraints and so would be able to pay taxes in cash when the gains had not yet been converted. The problem with this system, however, is in this very limitation to a very select group of taxpayers. The reason: A threshold such as this could create opportunities for gaming the system and generate perverse economic incentives to try to avoid falling within the ambit of this system. Miller suggests phasing the system in based on a combination of annual income and wealth in order to address this problem, but some incentives to game the system would remain. The Ohio State Law professor Ari Glogower recommends a system that would fully marry mark-to-market accounting with a charge for deferring capital gains.33 In this system, no tax would have to be paid until there was a realization event, as in the current system, but there would be a deferral charge applied to the sale of assets at that point.34 For assets that are publicly traded or readily valued, the deferral charge would be based on the specific path by which the gains accrued. For instance, if the gain had mostly occurred early on in the holding of the asset, then the deferral charge would be larger than if the gain occurred mostly toward the end of the holding period—since more deferral would have occurred in that case. For other assets that could not be so easily valued, the system would assume a constant rate of accrual over the period in which the asset was held as a type of “rough and ready” deferral charge. This would have many of the benefits of full mark-to-market accounting but would largely address the valuation and liquidity problems that could plague full mark-to-market accounting. Such a system could also apply more broadly than one that still included mark-to-market accounting, even only for publicly traded assets since there would not be same problem with liquidity for those who are not at the very top of the wealth distribution. But one argument against these more fundamental reforms is that these systems would tax not just real economic gain but also inflationary gain—the gain due to rising prices that do not reflect an actual increase in the real value of the property. The current system also taxes inflationary gain, but those gains are more than offset by the aspects of the current system that provide relief—especially the allowance of deferral, which these fundamental reforms would eliminate. In an environment of low and relatively predictable inflation, the problem of taxing inflationary gain is not as large as it otherwise would be. In fact, as a “rough-and-ready” adjustment, rates could be set lower than they otherwise would be, taking into account that a portion of gain would be due to inflation. There could be other, more exact ways to take inflation into account when calculating capital gains in these two types of mark-to-market and deferral-charge systems. For instance, taxpayers could elect to index their capital gains to inflation to create a reformed tax system that responds to changed conditions such as an unexpected increase in the rate of inflation. There is no good reason to tax inflationary gain in a reformed system if administrable alternatives are available. Fundamental tax reform of the capital gains tax could prove to be a difficult policy lift in Washington. An important, intermediate step to reforming the taxation of property transactions is to tax unrealized gains on property when that property is transferred in the form of either gifts or bequests. The wipeout of gains at death would no longer occur, which would have two key effects. First, there would be less incentive to defer any gains before that point. Without the prospect of a wipeout in gains at death, holders of property would be more willing to realize gains earlier. Second, even if property were held until death, the gains would not escape taxation. Altogether, the proposal is estimated by the Joint Committee on Taxation to raise nearly $250 billion over the next ten years, with revenue increasing from then on as the policy fully phases in.37 Notably, the administration proposal retains the current law treatment of property donated to charity, which exempts such property from taxation while providing a charitable deduction equal to the full fair market value. The reform of charitable deductions goes beyond the bounds of this report, but if that “double benefit” for the donation of appreciated property were limited or eliminated, then the revenue raised would be considerably larger. One key challenge with taxing these gains when they are transferred via gift or bequest is that there is not an arm’s-length sale to establish the fair market value. This poses significant administrative challenges when it comes to assets that are not publicly traded or readily valued, which compose roughly half of the wealth of Americans with assets greater than $2 million.38 Yet this challenge could be partly addressed because the current tax system already requires the valuation of transfers of large amounts of wealth by gift or bequest for purposes of estate and gift taxes. Thus, those already subject to estate and gift taxation would not require another round of valuation; the same valuation used for estate and gift tax purposes could be used to calculate the amount of gain on the property. Importantly, if a proposal such as this were adopted, the revenue-maximizing capital gains rate should rise because there would be no ability to avoid the tax by simply holding property and wiping out the gain upon bequest. There have not been estimates made of the degree to which this is the case, but it seems likely that taxing appreciated gain upon gift or bequest would make realizations less sensitive to the tax rate. Let’s examine in turn each of these challenges to the U.S. corporate income tax. Table 1 shows the perversity and absurdity of this corporate tax dodge. Reported foreign profits by U.S. corporations in Bermuda, for instance, are sixteen times the size of the country’s economy. There are two main methods that corporations are using to shift these profits. One is transfer pricing, and the other is earnings stripping. Here’s how both maneuvers work. Multinational corporations are generally composed of different subsidiary corporations and other related entities. The current U.S. corporate system respects the boundaries among these related entities and then asks corporation to determine how much in profits are “sourced” from U.S.-based entities. The rules require that, for tax purposes, these various related entities treat the transactions among themselves as if they were with an unrelated third party—the so called “arms-length” principle—so that the source of profits can be properly determined. The problem with this principle is that these entities are not in fact unrelated. That means the pricing of these transactions can be manipulated, despite the very transfer-pricing rules meant to stop such abuse. Property—especially intellectual property—developed in the United States gets sold to a related entity based in a low-tax country at a fire-sale price, leading to low profits in the United States and high profits abroad. Manipulation is particularly easy when it comes to intellectual property, since it is hard for the Internal Revenue Service to challenge the corporation’s valuation of these kinds of properties, such as patents and trademarks. The result is that U.S. corporations—especially ones with any significant intellectual property—can manipulate transfer pricing to shift much of their profitability overseas. debt owed to another part of the same company in a low-tax jurisdiction and then take a deduction for the interest against its U.S. profits. The interest is then taxed abroad in the low-tax country. This maneuver enables profits derived from a multinational company’s U.S. investment and its workforce to be reported overseas. Foreign-based multinational corporations with U.S.-based subsidiaries also can strip profits by paying royalties and other fees back to the parent corporation. Importantly, the same maneuver cannot be done as easily by a multinational with a U.S. parent—though U.S.-based companies can do this in other high-tax countries. 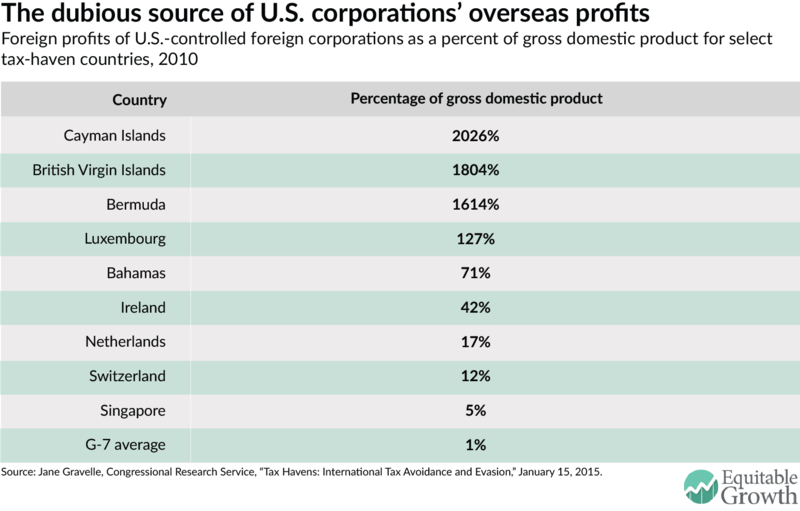 As a result, profits made in the United States get shipped overseas to tax havens, often in the form of interest, and this puts foreign-based corporations at an advantage operating in the United States because they can more easily engage in these maneuvers than U.S.-based corporations under current tax rules. This, in turn, puts substantial pressure on U.S. corporations to manipulate their “residence” in the United States and, in part, motivates so-called corporate inversions and foreign takeovers. The issue of corporate residence is taken up in the next section. The tax treatment of corporations in the United States is based in part on the “residence” of the corporation, and residence is also adjustable. U.S.-resident corporations, for example, are sometimes subject to tax on foreign profits, but when it comes to profits of “active” business operations—as opposed to “passive” income (such as interest and dividends) from investments—that tax only applies when those profits are eventually repatriated. U.S. corporations today boast more than $2 trillion in un-repatriated profits,44 and some are changing their residence to foreign countries in order to gain access to these profits without ever paying tax in the United States. Another example of how residence matters is in terms of a corporation’s ability to strip profits out of the United States using intra-company debt. As discussed above, that is much easier for a foreign-based multinational corporation than one based in the United States. The result of this pressure on residence is a spate of transactions to move the residence of U.S. corporations abroad, driven in part by a desire to reduce U.S. corporate taxes. Some of these transactions are in the form of more egregious “inversions” in which U.S. corporations merge with smaller foreign partners in order to establish residence abroad. Others are in the form of more traditional takeovers by larger foreign corporations. Such gaming of the U.S. corporate tax system—often involving purely paper transactions—is the central challenge facing the corporate income tax, but the movement of actual economic activity is also an attendant concern. Among other issues, in a source-based tax system, corporations may choose to source real economic activity in lower-tax jurisdictions. This generates inefficiency because the investment decisions are being, in part, driven by differences in the tax rate rather than where the investments would be most productive. What’s more, such manipulation can shift the collection of the U.S. corporate tax away from capital toward labor—to the degree that capital can escape taxation by shifting the location of the investment and leaving labor, which is relatively immobile, to pay more of the tax. In that case, the owners of the corporation essentially escape at least some of the economic burden of the tax, and labor pays more of the burden, since labor would be less productive with some capital having flowed out of the country. In the current system, evidence suggests that there are not substantial shifts in the location of corporate investments due to the corporate tax. As Clausing summarizes, “there is not a clear robust relationship between corporate tax policy variables and investment levels or the resulting capital stocks across OECD countries over the previous 30 years.”45 Yet it is possible that at least some of this lack of sensitivity in corporations’ investment decisions reflects the ease with which multinational corporations game the corporate tax system precisely because they are able to separate the tax rate from the location of their economic activity.46 So, such shifts in economic activity remain a concern, perhaps especially in a reformed corporate tax system that would make gaming harder to do. Importantly addressing the problems facing the U.S. corporate income tax would benefit greatly from international cooperation to help avoid both the non-taxation of profits and double (or more than that) taxation of profits across different national tax jurisdictions. Recently, the OECD undertook a significant project on “base erosion and profits shifting,” and made a number of recommendations to try to improve how countries measure the source of corporate profits while maintaining the same basic structure as now exists.47 Some of these recommendations are reflected in the intermediate steps discussed below, such as cracking down on the ways in which corporations use intra-company debt and transfers of intangibles to shift profits. But cooperation along these lines cannot overcome some of the fundamental weaknesses of the current approach—the source of profits could still be manipulated since transfer pricing among related entities would still undergird the system. These two fundamental reforms are detailed below. Switching from taxing the “source” of the activity generating corporate profits to the “destination” of the products or services generating the profits would reduce or eliminate the ability to cut a corporation’s tax bill by manipulating the source of profits, shifting the residence of the corporation, or the location of real economic activity. Leading proposals in this regard often involve systems of “formulary” apportionment that rely mostly on where the corporation makes its sales.48 Specifically, related entities across a corporation, both in the United States and abroad would be treated as a single financial unit, with combined reporting of profits. The profits would then be divided among countries based on a formula that emphasizes the share of sales in each country (but could also include items such as the share of workforce in each country). In the vision of most proponents of formulary apportionment, the United States would tax only the profits allocated to the United States based on this formula. The idea here is that sales would be harder for corporations to manipulate than the prices that related corporate entities charge each other. Other factors could potentially be taken into account in the formula—such as payroll or assets—but there is reason to think that the location of sales would tend to be less sensitive to tax than these other economic activities.49 In such a reformed system, if a U.S. corporation had shifted its key intellectual property to an Irish subsidiary at a fire-sale price then it would no longer matter—to the extent the corporation’s sales were in the United States so would be taxes on its profits under the system. The current “source” rules would be retired. The apportionment of corporate sales for tax purposes, however, is not without its own downsides. Sales, too, can be manipulated,52 and tax incentives for such manipulation in the federal system would be much larger than in the U.S. states since rate differentials would be greater. For instance, products could be cycled through low-tax countries. Apple Inc. could build its iPhone in the countries where it currently manufactures them, sell the completed product to an unrelated distributor in a low-tax country, and then the distributor could sell to the United States. In this way, Apple would largely avoid U.S. taxation of its profits since its sales would only go to the low-tax country. Anti-abuse provisions would be needed to stop such transactions. Even so, there could be successful planning that would be hard to stop with anti-abuse provisions. Returning to the Apple example: Imagine Apple licensing the design for an iPhone to other, unrelated companies in low-tax jurisdictions to produce and sell the device. Apple’s high-margin activity of developing the design might escape taxation in the United States, and it could be challenging to stop with anti-abuse provisions. With that said, formulary apportionment would probably be more difficult to manipulate than transfer-pricing rules. A licensing transaction such as the one imagined for Apple would require completely redoing its highly successful business structure, which it very well might not do. In contrast, transfer-pricing games only require a well-paid accountant manipulating often paper-transactions among related entities. There are other approaches to implementing “destination-based” corporate taxes that deserve serious consideration. For instance, public finance and economics professor Alan Auerbach at the University of California-Berkeley suggests a system in which the foreign transactions of U.S.-based corporations are simply ignored for tax purposes, but there would then be a tax imposed on imports into the country as part of a a so-called border-adjustment system.53 Auerbach grafts this system onto a larger reform that would shift the corporate system to only taxing above-market returns on investment—the extraordinary returns that pay more than that normally available in the market—and not on ordinary returns (the normal returns available in the market). His proposal would do this by allowing for the full expensing of capital investment; the immediate write off of capital investment then would limit the corporate tax to taxing these extraordinary returns. Auerbach’s destination-based international reform, however, could potentially be done separate from allowing the full expensing of capital investments. Auerbach suggests this style of reform would be less open to manipulation and less distortive than a formulary apportionment approach. This is because his proposed tax system could not be gamed, for instance, by routing sales through foreign distributors or even rearranging licensing arrangements like in the Apple example above, so long as there is a border-adjustment tax on imports. Effectively taxing capital in large part comes down to trying to tax it in ways that are less susceptible to tax planning and gaming than the current system. The current U.S. corporate income tax system is gameable in large part because it puts so much pressure on the source of profits and the residence of corporations. The reforms discussed above would be significant improvements across both of these dimensions. But in some cases, the corporate tax would remain susceptible to planning and gaming. For instance, formulary apportionment would be better than the current source rules yet sales too can be gamed. And, if the residence of corporations remains a significant factor in corporate taxes then that too can be manipulated—even if the rules are strengthened. There are several methods for shifting more of the tax burden onto individuals from the corporate entity. One attractive approach is using the corporate entity to tax only the extraordinary returns to investment—the above-market returns that come from luck, market power, or other factors. A recent paper sponsored by the International Monetary Fund and by leading tax scholars recently set out the case for focusing the corporate tax on these rents, which they argued that the corporate tax could more effectively tax—while ordinary returns to capital would be taxed at the individual level.56 A reform such as this could be done in a number of ways, including the expensing regime discussed above. Another approach to shifting the tax burden is to simply reduce the corporate tax rate—reducing the tax rate on both ordinary and extraordinary returns at the corporate level. Still, there are several barriers to shifting the corporate tax burden to shareholders. First, there is a question of how to actually get shareholders to pay more in taxes than they do now. Simply increasing capital gains and dividends rates will not generate much in revenue due to the realization rule on property. (See pages 18-22 of this report for details.) So a strategy of shifting the tax burden probably should involve combining this new system with a fundamental reform of capital gains taxation, either mark-to-market taxation or a deferral charge, and using part of the revenue to finance either focusing the corporate tax system only on extraordinary returns to investment or reducing the corporate tax rate. Reforms such as this—combining reductions in the corporate income tax with fundamental reform of taxation at the shareholder level to increase their taxes—have recently been suggested by Eric Toder at the Urban Institute and Alan Viard and the American Enterprise Institute as well as by Harry Grubert at the U.S. Treasury Department’s Office of Tax Analysis and Rosanne Altshuler at Rutgers University.57 The proposals they put forward are designed to be revenue-neutral, but there is no reason that they could not be designed to be revenue-enhancing. These fundamental reforms have the potential to generate significant additional revenue. And, they do so more efficiently than the current system and with greater confidence that the burden really will fall on the owners of capital. Auerbach, for instance, suggests that his proposed reform—to shift to a destination-based system while only taxing extraordinary returns at the corporate level—would have a small net impact on revenue, and potentially a positive one.61 The proposal could raise more revenue if either the plan were changed to continue to tax the ordinary return to investment at the corporate level or, alternatively (and probably better), the proposal were combined with fundamental reform at the individual level to better tax returns to capital there. Similarly, a number of the other fundamental reform proposals discussed here have been designed to be revenue-neutral, as a way to focus on the improvements in administration and efficiency. But changing their parameters could make them revenue-enhancing. The revenue at issue is likely to be significant. Revenue-enhancing versions of these reforms could potentially generate many hundreds of billions of additional revenue over the next ten years—and, again, more efficiently and fairly than we do now. Some intermediate steps would involve keeping the same basic structure of the U.S. corporate income tax as we have now but making both source-based and residence-based criteria harder to manipulate for corporations, and to make those factors matter less than they now do. Let’s examine each of these steps in turn. The current U.S. corporate tax system allows for deferring the payment of taxes on active foreign profits, which puts significant pressure on the “source” rules. Even though taxation on those foreign profits in the United States would—in theory—eventually be imposed, corporations seem to treat deferral as a significant tax benefit. They may have never intended to repatriate their foreign profits or they may believe that the tax rate on repatriated profits will eventually be lower than it is today. Whatever the case, the ability to defer paying taxes on foreign profits incentivizes corporations to try to shift profits out of the United States to take advantage of deferral. One way to defend against such profit shifting by U.S. corporations is to tax the foreign profits of the corporations at a higher rate than is now effectively imposed through the deferral system. A key challenge, though, is that the more corporate taxes are imposed on the foreign profits of U.S.-based corporations, the greater the pressure is on “residency.” The minimum tax could be avoided entirely if corporations were not U.S.-based. Measures could be taken to make residence less open to manipulation by multinational corporations, but those measures are by no means full-proof, and residence will remain, to a significant degree, adjustable by corporations. The United States probably boasts more “market power” when it comes to the decisions made by corporations on their residencies, which allows the federal government to impose greater taxes on foreign profits than other nations. But there is a trade-off here—a trade-off that some of the fundamental reforms discussed above overcome by switching to a destination based tax system where residency is far less important. The first reform would reduce the importance of source—since it would tax foreign-source profits of U.S. corporations more like U.S.-source profits. Nonetheless, source would still matter. It would matter for U.S. corporations because the tax rate on foreign profits would remain below that in the United States under a minimum tax, and it would matter for foreign-based corporations because profits booked outside the United States would go untaxed here. Thus, the incentive for corporations to manipulate source would remain. This reform would essentially be a backup to the current “arms-length” standard, which allows the IRS to pursue transactions retrospectively based on actual performance. Another alternative is to switch to formulary apportionment of profits (see pages 30-31 above) but on a targeted basis, such as by targeting intellectual property specifically. The current corporate tax system is proving particularly inadequate in this regard. Together, measures such as these would be important steps in improving the current “source” rules. Estimates of the Obama Administration’s corporate tax reform proposals along these lines—addressing excess profits from profits derived from intellectual property booked abroad and from earnings stripping—suggest that the federal government could raise more than $90 billion over the next decade.68 Still, even with these protections, the source-based tax rules would remain a deep weakness of the current system, which is why more fundamental reforms are needed. The United States could go beyond this, for instance, by adopting a so called management-and-control test, whereby corporate residency would be determined by where the merger occurred rather than place of incorporation. A management-and-control test, however, comes with the downside of potentially generating actual shifts in management and control abroad to avoid U.S. corporate residency. In short, there are ways to strengthen the concept of residency, but, even with such incremental steps, it would remain another weakness of the corporate tax code without more fundamental reforms. The Obama Administration has proposed a package of international tax reforms incorporating proposals like those discussed above and estimates suggest that they will raise more than $400 billion over the next decade, excluding the one-time revenue from taxing un-repatriated earnings.71 Including that one-time revenue, the revenue raised reaches over $600 billion.72 The Administration, however, envisions enacting this full package of measures as part of a reform that would also reduce the U.S. corporate tax rate. While a reform of this model has the potential to significantly improve the U.S. corporate income tax system and raise revenue, it would not fully alleviate some of the fundamental weaknesses of source and residence based taxation like the more fundamental measures discussed above. The federal government levies very limited taxes that apply to wealth—defined in this paper as the stock of capital—as opposed to income, which is the increased value of that capital over time. Specifically, the federal government taxes transfers of wealth via gift or bequest, but that applies to only a sliver of estates and gifts—and tax planning can relatively easily reduce total tax liabilities for the wealthy. This ratio is likely a significant overstatement, since estate and gift taxes probably undervalue wealth. One study by the IRS found that valuations for estate tax purposes are roughly half that of the Forbes 400, comparing those listed on the Forbes 400 to their estates after they died.76 Of course, it is possible that Forbes over-estimated the wealth of those listed. Yet according to the IRS some significant share of this discrepancy in declared wealth is probably due to tax-planning techniques, including the use of special “valuation discounts” and trusts.77 This suggests that estate and gift taxes are not capturing the full value of wealth being transferred—and is certainly not capturing it once every generation. University of California-Berkeley economists Saez and Zucman estimate that the top 0.1 percent of wealth holders in the country—with wealth in excess of $20 million each—held roughly $11 trillion in wealth as of 2012.78 An estate-and-gift tax generating $20 billion per year represents less than 0.2 percent of that amount. In sum, the current estate-and-gift tax is a narrow wealth tax that raises less than it used to, is easily avoided with tax-planning techniques, and is small relative to both total wealth and wealth being transferred. There are at least two routes for fundamentally reforming federal wealth taxes. The first is to keep a system focused on transfers of wealth but switch the payer from the estate to the person actually receiving the inheritance—an actual inheritance tax. The second is a broader wealth tax applied on a regular basis, which would be a much more significant reform. An inheritance tax would change who pays transfer taxes on wealth. Instead of the tax being paid by the estate, it would be paid by the recipient. The change would not just be in terms of who literally sends the funds to the federal government. A reform recommended by Lily Batchelder, a professor of law and public policy at the New York University School of Law, comes with a number of innovations.79 First of all, her proposed inheritance tax would take into account the economic status of the recipients, which may be seen as fairer than applying the tax on a per-estate basis. As a result, the exemption would apply per recipient—so if an estate were divided among many heirs, there would be a lower tax bill than the alternative. Further, under her proposal, the tax rate for a recipient would depend in part on the amount of income from other sources. And yet another benefit of her approach is that the tax applies as transfers are received, which means that trusts would no longer be as effective at avoiding taxation because the transfers from the trust would taxed as they are received by the heirs. There would no longer be a challenge of valuing trust interests at the time they are created—a valuation challenge that sophisticated planners use in gaming the system. The inheritance tax has very real benefits in terms of fairness and administration, yet the overall incidence of heirs paying the tax is unlikely to be dramatically different from the current estate-and-gift tax system. Generating more revenue from the tax will come down to asking many of the same beneficiaries of transfers of wealth to effectively pay more than they do currently. These reforms may be a more elegant solution for a number of reasons, but it does not fundamentally change that dynamic in terms of revenue for the federal government. Thus, reforms of this variety are likely to raise amounts that measure in the several hundred billions of dollars—not all that different (in terms of pure revenue generation) from the intermediate reforms discussed below. Another administrative benefit of wealth taxation at regular intervals is that it may be harder to plan around than estate-and-gift taxes alone. Estate-and-gift taxes apply a wealth tax at one point in time: the point at which the wealth is transferred. As a result, it can become easier to set up structures, such as minority interests and trusts, to prepare to game valuation at that one point—as compared to having to plan around a wealth tax that is applied at regular intervals. Notably, several countries currently administer recurring wealth taxes. Of the 34 developed and advanced-developing member nations of the OECD, 11 raised revenue from a recurring wealth tax as of 2013.82 The median amount raised among those countries with a wealth tax was about 0.4 percent of GDP, or equivalent to about $75 billion per year in the United States today. Countries with a wealth tax include France, which raises about 0.2 percent of GDP by imposing a wealth tax that affects those with total net wealth exceeding 1.3 million euros (though the French tax excludes a number of assets including business assets and antiques), and Switzerland, which raises about 1 percent of GDP with a tax that applies more broadly than the French version, though the rate varies by canton. To be clear, though, regular wealth taxation in the United States would face administrative and potential legal challenges. The greatest administrative challenge would be regularly valuing assets that are not publicly traded. For the wealthiest Americans, such assets compose a significant share of their wealth. Estate tax data suggest that such assets comprise about one-half of total assets among the extremely wealthy, and that may understate the situation since these assets tend to be under-valued.83 In fact, battles over valuation in the estate-and-gift tax system can be lengthy. Of course, the estate-and-gift tax system does attempt to do such a valuation for all these assets, but it occurs only once per generation. If a wealth tax were successfully administered and upheld by the courts, then it has the potential to raise substantial revenue. Using the wealth figures from Saez and Zucman, a 1 percent tax on wealth of more than $20 million in 2012 (the top 0.1 percent) would have raised about $80 billion, assuming no behavioral or planning effects. Growing that amount with GDP, that is equivalent to in excess of $1 trillion in revenue over the next ten years. Yet challenges in administration and any behavioral effects would tend to reduce the revenue generated. Steps could be taken to strengthen existing estate-and-gift taxes under current law. There are two key categories of reforms that should be pursued, elements of which are now reflected, for instance, in President Obama’s latest budget proposal. Specifically, the administration recommends restricting the ability of the wealthy to avoid taxation through tax-planning techniques and changing the estate-and-gift tax rate and exemptions to raise additional revenue. There are a number of techniques that tax planners use to try to significantly reduce tax liabilities by under-valuing estates. These tax planning techniques should be closed down. They include so called “minority discounts,” which allow families to divide ownership of assets among the family members so that each individual stake is discounted relative to the value of the combined company, and trust instruments such as grantor-retained annuity trusts and perpetual trusts, which can be used avoid taxes on transfers of wealth. For instance, perpetual trusts allow wealth to be passed on to future generations without it facing taxation with each subsequent generation that benefits. The estate tax is now highly circumscribed in terms of the revenue it generates in large part because the exemption has gone significantly up and the rate has gone down. That both removes many estates from tax system but also benefits much larger estates, both from the lower rate and higher exemption. The Obama Administration calls for returning to the 2009 parameters of the estate tax, with a top rate of 45 percent and an exemption of $7 million per couple. While not raising as much revenue as more fundamental reforms, expanding the taxation of estates in these ways will help bolster the progressivity of the U.S. tax system, reduce wasteful tax planning, and generate resources for income-enhancing investments in the economy. In a world of sophisticated tax planners and mobile capital, there are serious challenges to taxing capital in the United States. But there are answers to these challenges, largely involving reforms to the tax rules that make it much harder for capital to escape taxation by shifting locale either on paper or in reality, or reducing (and, in some cases, even eliminating) tax by deferring gain. Of course, tax planning and distortions will remain, irrespective of the reforms that are adopted. Yet the U.S. tax system can do much better than it now does. The current level of tax planning and distortions is not inevitable—it is a function of a system in need of reform. Fighting for higher tax rates alone is insufficient. How we tax capital must change. There are concrete proposals that exist to address the key issues that the system faces. This report presented a combination of fundamental reforms to work towards that would bolster how the United States taxes capital, alongside some intermediate reforms that would still do much to address the underlying problems. There are compelling reasons to expand the taxation of capital, given the low average tax rates that currently apply, increasing inequality in the country, and the federal government’s need for new revenue to support key programs and investments to ensure strong economic growth and stability. 1 Thomas Piketty, Capital in the Twenty-First Century, transl. Arthur Goldhammer (Cambridge, MA: Harvard University Press, 2015). 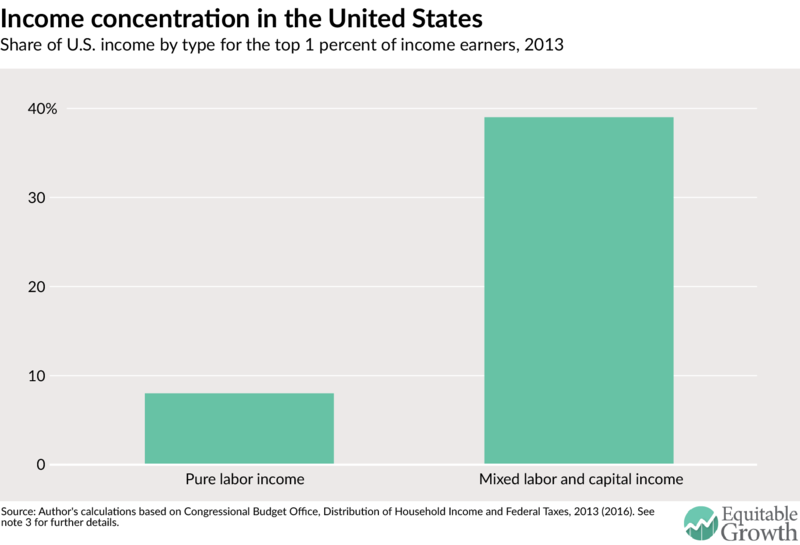 3 These figures on income concentration (also reflected in Figure 1) are derived from data from the Congressional Budget Office. See Congressional Budget Office, “Supplemental Data: The Distribution of Household Income and Federal Taxes, 2013” (2016), tbl. 7, https://www.cbo.gov/sites/default/files/114th-congress-2015-2016/reports/51361-SupplementalData-2.xlsx. The percentiles are ranked in terms of before-tax and transfer income. For purposes of these calculations, pure labor earnings are considered to be salary and benefits of employees (including payroll taxes paid by the employer and labor’s share of the corporate income tax). The income mixing capital and labor includes capital income, capital gains, business income, and income from other sources. are ranked by net worth. 5 Congressional Budget Office, Taxing Capital Income: Effective Marginal Tax Rates Under 2014 Law and Selected Policy Options (2014). 6 Kimberly A. Clausing, Washington Center for Equitable Growth, Profit-Shifting and U.S. Corporate Tax Policy Reform, (May 2016). 7 Joel Slemrod, “Do Taxes Matter? : Lessons from the 1980s,” American Economic Review 82 (1992): 250-56. 8 Emmanuel Saez, Joel Slemrod, and Seth H. Giertz, “The Elasticity of Taxable Income with Respect to Marginal Tax Rates: A Critical Review,” Journal of Economic Perspectives 50 (2012): 42. 9 David Kamin, Getting Americans to Save (Working Paper, 2016). 10 See, e.g., Daniel J. Benjamin, “Does 401(k) Eligibility Increase Saving? Evidence from Propensity Score Subclassification,” Journal of Public Economics 87 (2003): 1259-1290; Victor Chernozhukov and Christian Hansen, “The Effects of 401(k) Participation on the Wealth Distribution: An Instrumental Quantile Regression Analysis,” 86: 735-751; Eric M. Engen and William G. Gale, “The Effects of 401(k) Plans on Household Wealth: Differences Across Earnings Groups” (2000), Working Paper No. 8032 (Nat’l Bureau of Econ. Research, Working Paper 8032, NBER. 12 Kimberly Clausing, “The Future of the Corporate Income Tax,” Tax Law Review 66 (2013): 419-444. 13 Juan Carlos Conesa, Sagiri Kitao, and Dirk Krueger, “Taxing Capital? Not a Bad Idea After All!” American Economic Review 99 (2009): 25-48. 14 Thomas Piketty and Emmanuel Saez, “A Theory of Optimal Capital Taxation” (2012), Working Paper 1789, NBER. perhaps the strongest reason why governments would be reluctant to completely exempt capital income and tax only labor income.” Peter Diamond and Emmanuel Saez, “The Case for a Progressive Tax: From Basic Research to Policy Recommendations,” Journal of Economic Perspectives 25 (2011): 181. 16 See David Gamage, “How Should Governments Promote Distributive Justice? : A Framework for Analyzing the Optimal Choice of Tax Instruments,” Tax Law Review 68 (2014): 1-87; David Gamage, “The Case for Taxing (All of) Labor Income, Consumption, Capital Income, and Wealth,” Tax Law Review 68 (2015): 355-441. 17 See, e.g., Emmanuel Saez, Washington Center for Equitable Growth, U.S. Top One Percent of Income Earners Hit New High in 2015 Amid Strong Economic Growth (July 2016). 18 See Julie Ann-Cronin et al., Distributing the Corporate Income Tax: Revised U.S. Treasury Methodology (2012); Congressional Budget Office, The Distribution of Household Income and Federal Taxes, 2008 and 2009 (2012): 16-18, https://www.cbo.gov/sites/default/files/112th-congress-2011-2012/reports/43373-06-11-HouseholdIncomeandFedTaxes.pdf. For a recent, comprehensive discussion of the incidence of the corporate income tax, see Kimberly A. Clausing, “In Search of Corporate Tax Incidence,” Tax Law Review 65 (2012): 433-472. She notes that a number of studies have found that a significant share of the incidence of the corporate tax would fall on labor, but concludes that, based on her own empirical work, “some evidence . . . suggests that corporate taxation may lower wages, but the preponderance of evidence does not suggest any wage effects from corporate taxation.” Ibid., 468. 19 See note 59 and accompanying text. 20 For a review of the arguments specific to taxation of transfers of inter-generational wealth, see Lily Batchelder, “What Should Society Expect from Heirs: The Case for a Comprehensive Inheritance Tax,” Tax Law Review 63 (2009): 5-44; Thomas Piketty and Emmanuel Saez, “A Theory of Optimal Inheritance Taxation,” Econometrica 81 (2013): 1851-1886. 23 Congressional Budget Office, “Supplemental Data: The Distribution of Household Income and Federal Taxes, 2013,” tbl. 7. 24 Internal Revenue Service, The 400 Individual Income Tax Returns Reporting the Largest Adjusted Gross Incomes Each Year, 1992–2013 (2016), https://www.irs.gov/pub/irs-soi/12intop400.pdf. 26 This static estimate of revenue gain is an estimate based on: (1) CBO’s projection of capital gains realizations available from a supplemental to its January 2015 Budget and Economic Outlook, and (2) A projection of qualified dividends done by the author that assumes that they average the same share of GDP over the next decade as they have since qualified dividends were introduced in 2003. 27 Congressional Budget Office, Options for Reducing the Deficit: 2015 to 2024 (2014), Option 48, https://www.cbo.gov/budget-options/2014/49574. 28 Reports vary on the exact revenue-maximizing tax rate under the assumptions of the Joint Committee on Taxation and Treasury. For instance, Leonard Burman reports the revenue-maximizing rate to be about 28 percent for the JCT and Treasury. See Leonard Burman, “Tax Reform and the Tax Treatment of Capital Gains, Statement Before the House Committee on Ways and Means and the Senate Committee on Finance” (Sept. 20, 2012), 8. Discussions between this author and officials familiar with capital gains estimates suggest a revenue-maximizing rate in the range of 28 to 30 percent. However—and somewhat inconsistent with these reports—Jane Gravelle describes elasticity assumptions consistent with a revenue maximizing rate of 32 percent in the case of the JCT and 31 percent in the case of Treasury. Jane G. Gravelle, Congressional Research Service, Capital Gains Tax Options: Behavioral Responses and Revenues (2010), 7 tbl. 1. 29 While advocating for a system of mark-to-market taxation of publicly traded assets, David Miller nicely summarizes some the long-standing critiques of such systems. See David Miller, “A Progressive System of Mark-to-Market Taxation,” Tax Notes (2005), 1053. 30 One way to avoid both annual valuation and any tax incentive to defer (or realize) gain is to tax based on an assumed rate of return derived from the market rate of return. For instance, see Alan J. Auerbach, “Retrospective Capital Gains Taxation,” American Economic Review 81 (1991): 167-178. Yet this would divorce the tax on any particular asset from its idiosyncratic performance, and, perhaps most importantly, would not effectively tax extraordinary returns including returns that mix returns to both labor and capital. 31 David Miller, “A Comprehensive Mark-to-Market Tax for the 0.1% Wealthiest and Highest-Earning Taxpayers” (2016), Working Paper, http://ssrn.com/abstract=2710738 or http://dx.doi.org/10.2139/ssrn.2710738. 32 Miller frames his deferral charge somewhat differently than what is described here. In particular, Miller describes his system as one of “retrospective application” of mark-to-market accounting for non-publicly traded assets at the point that gain is realized. The taxpayers would be left in the same position as if the assets had appreciated at a constant rate, been subject to mark-to-market, and paid the tax by reducing the taxpayer’s position in the relevant asset. This is another way of applying a deferral charge, with the charge calculated based on the average yield of the asset involved. Ibid. 33 See Ari Glogower, “Taxing Capital Appreciation,” Tax Law Review (forthcoming 2016). 34 Glogower recommends a deferral charge based on the federal short-term borrowing rate plus three percent. This is in contrast to the Miller approach where the deferral charge is based on the yield of the particular asset involved. 35 Eric Toder and Alan Viard, A Proposal to Reform the Taxation of Corporate Income (2016), 50, http://www.taxpolicycenter.org/sites/default/files/alfresco/publication-pdfs/2000817-a-proposal-to-reform-the-taxation-of-corporate-income.pdf. Notably, Viard and Toder use the revenue from mark-to-market taxation to reduce the corporate income tax rate. 36 For a more detailed description of the Administration’s proposal to reform capital gains taxation, see Department of the Treasury, Administration’s Fiscal Year 2017 Revenue Proposals (2016), 155-156. 37 Joint Committee on Taxation, Revenue Provisions in the President’s FY 2017 Budget, 7. 38 See David Kamin, “How to Tax the Rich,” Tax Notes (2015), 123 tbl. 1. 39 See Office of Management and Budget, “Table 2.3—Receipts by Source as Percentages of GDP,” https://www.whitehouse.gov/omb/budget/Historicals. 41 For the share of profits of U.S.-controlled foreign corporations reported in these tax havens, see Gabriel Zucman, The Hidden Wealth of Nations: The Scourge of Tax Havens (Chicago: University of Chicago Press, 2015), 105. Note that Zucman includes the Caribbean tax havens in a single category. Table 1 in this report (listing U.S. corporate profits as a share of GDP by country) shows most of the major Caribbean tax haven countries listed separately. These data on profits relative to the GDP comes from Jane G. Gravelle, Congressional Research Service, Tax Havens: International Tax Avoidance and Evasion (2015), 17-18. 42 Clausing, “The Effect of Profit Shifting on the Corporate Tax Base,” 432 tbl. 2. 43 Zucman, Hidden Wealth, 107. 44 Citizens for Tax Justice, “$2.1 Trillion in Corporate Profits Held Offshore” (2015), http://ctj.org/pdf/repatriation0715.pdf. 45 Kimberly A. Clausing, “Who Pays the Corporate Tax in a Global Economy,” National Tax Journal 66 (2013): 151-184. 47 For an overview of the OECD BEPS project, see Joint Committee on Taxation, Background, Summary, and Implications of the OECD/G20 Base Erosion and Profit Shifting Project (2015). Reforming Corporate Taxation in a Global Economy: A Proposal to Adopt Formulary Apportionment (2007), http://www.hamiltonproject.org/assets/legacy/files/downloads_and_links/Reforming_Corporate_Taxation_in_a_Global_Economy-_A_Proposal_to_Adopt_Formulary_Apportionment.pdf. 50 Kimberly Clausing, “The U.S. State Experience Under Formulary Apportionment,” National Tax Journal (forthcoming 2016). 51 Jack Mintz and Michael Smart, “Income Shifting, Investment, and Tax Competition: Theory and Evidence from Provincial Taxation in Canada,” Journal of Public Economics 88 (2004): 1149–1168. 52 For criticism of sales-based formulary apportionment as still being gameable, see Rosanne Altshuler and Harry Grubert, “Formula Apportionment: Is It Better Than the Current System and Are There Better Alternatives?,” National Tax Journal 63 (2010): 1145–1184. 54 For an overview of some of the arguments for why formulary apportionment could be done consistent with existing tax treaties, see Kimberly Clausing and Reuven S. Avi-Yonah, Reforming Corporate Taxation in a Global Economy: A Proposal to Adopt Formulary Apportionment (2007), 23-24, https://www.brookings.edu/wp-content/uploads/2016/06/200706clausing_aviyonah.pdf. And, for an overview of some of the arguments why both formulary apportionment and an Auerbach-style destination-based tax (what some call a destination-based cash flow tax) are consistent with WTO obligations, see Wolfgang Schön, Destination-Based Income Taxation and WTO Law: A Note (2016). These positions, however, are contested, and the Auerbach-style destination-based tax may be more vulnerable to challenge under trade treaties if expensing for capital investment were not allowed in the system. 55 See Kimberly Clausing, Edward Kleinbard, and Thornton Matheson, International Monetary Fund, U.S. Corporate Income Tax Reform and its Spillovers (2016), 24. 57 See, e.g., Toder and Viard, A Proposal to Reform the Taxation of Corporate Income; Harry Grubert and Rosanne Altshuler, “Shifting the Burden of Taxation from the Corporate to the Personal Level and Getting the Corporate Tax Rate Down to 15 Percent” (2015), Working Paper. 58 Toder and Viard, A Proposal to Reform the Taxation of Corporate Income, 50. 59 Steven M. Rosenthal and Lydia S. Austin, “The Dwindling Taxable Share of U.S. Corporate Stock,” Tax Notes (2016). 60 Toder and Viard, A Proposal to Reform the Taxation of Corporate Income, 26-27. 61 Auerbach, Modern Corporate Tax, 13. 62 The 19-percent minimum tax applied on a per country basis and on a tax base that excluded a risk-free return on active assets in a country. It allowed a partial credit for taxes paid in the foreign country—equal to 85 percent of taxes paid. For more details, see Treasury, Administration’s Fiscal Year 2017 Revenue Proposals, 9-12. 63 Joint Committee on Taxation, Revenue Provisions in the President’s FY 2017 Budget, 1. 64 For instance, Ed Kleinbard supports “worldwide consolidation”—with the profits of U.S. firms abroad and at home taxed at the same rate. Kleinbard has suggested this might be workable with a 25 percent corporate tax rate (down from the current 35 percent). See Edward Kleinbard, “Testimony Before the Committee on Ways and Means” (June 13, 2013). 65 For a description of a proposal like this from the Obama Administration, see Department of Treasury, General Explanations of the Administration’s Fiscal Year 2015 Revenue Proposals (2014), 45-46. 66 For a description of a proposal like this from the Obama Administration, see Treasury, Administration’s Fiscal Year 2017 Revenue Proposals, 2-4. See also Martin Sullivan, “The Many Ways to Limit Earnings Stripping,” Tax Notes (2014). 67 See Department of the Treasury, “Fact Sheet: Treasury Issues Inversion Regulations and Proposed Earnings Stripping Regulations” (April 4, 2016), https://www.treasury.gov/press-center/press-releases/Pages/jl0404.aspx. 68 This is the amount if done separately from a minimum tax like that proposed by the Obama Administration. If done in combination, the amounts raised by these discrete provisions would be less. For an estimate of the amount raised from a retrospective look back on excess profits from intangibles, see Joint Committee on Taxation, Estimated Effects of the Revenue Provisions in the President’s FY 2015 Budget Proposal (2014), 2, https://www.jct.gov/publications.html?func=startdown&id=4585. For an estimate of the amount raised by limiting earnings stripping, see JCT, Revenue Provisions in the President’s FY 2017 Budget Proposal, 1. 69 For a description of this proposal, see Treasury, Administration’s Fiscal Year 2017 Revenue Proposals, 27-28. 70 JCT, Revenue Provisions in the President’s FY 2017 Budget Proposal, 1. 73 For projections of the share of estates that are now taxable, see Tax Policy Center, “Estate Tax Returns and Liability Under Current Law and Various Reform Proposals, 2011-2022” (2013), http://www.taxpolicycenter.org/numbers/displayatab.cfm?DocID=3775&topic2ID=60&topic3ID=66&DocTypeID=. For historical data on the share of estates subject to the estate tax, see Internal Revenue Service, “Historical Table 17: Taxable Estate Tax Returns as a Percentage of Adult Deaths, Selected Years of Death,” https://www.irs.gov/uac/SOI-Tax-Stats–Historical-Table-17. 74 For projections of estate and gift tax liability under current law, see Congressional Budget Office, “Supplemental Data: Updated Budget Projections: 2016 to 2026” (2016), https://www.cbo.gov/sites/default/files/51138-2016-03-RevenueProjections.xlsx. For historical estate tax liability, see Office of Management and Budget, “Table 2.5—Composition of Other Receipts,” https://www.whitehouse.gov/omb/budget/Historicals. 75 Tax Policy Center, “Current Law Distribution of Gross Estate and Net Estate Tax by Size of Gross Estate, 2013” (2013), http://www.taxpolicycenter.org/numbers/displayatab.cfm?DocID=3776&topic2ID=60&topic3ID=66&DocTypeID=. 76 Brian Raub, Barry Johnson, and Joseph Newcomb, “A Comparison of Wealth Estimates for America’s Wealthiest Decedents Using Tax Data and Data from the Forbes 400,” National Tax Association Proceedings of 103rd Annual Conference on Taxation (2013): 128–135, https://www.irs.gov/pub/irs-soi/13rpwealthforbes.pdf. 78 Emmanuel Saez and Gabriel Zucman, “Wealth Inequality in the United States since 1913: Evidence from Capitalized Income Tax Data,” Quarterly Journal of Economics 131 (2016): 552 tbl. 1. 79 Lily Batchelder, “What Should Society Expect from Heirs? A Proposal for a Comprehensive Inheritance Tax,” Tax Law Review 63 (2009): 1-112. 81 Zucman, Hidden Wealth, 98-101. 82 Organization for Economic Cooperation and Development, “Revenue Statistics: Comparative Tables,” https://stats.oecd.org/Index.aspx?DataSetCode=REV#. 83 Kamin, “How to Tax the Rich,” 123 tbl. 1. 84 Rolf Wüthrich and Noëmi KunzSchenk, “New Swiss Practice for Net Wealth Taxation of Shares in StartUps,” International Tax Review, March 18, 2016. 85 For a brief history of the “direct tax” doctrine, see Alan O. Dixler, “Direct Taxes Under the Constitution: A Review of the Precedents,” Tax Notes (2006): 1177. Dixler concludes that a federal tax on net worth should not be treated as a direct tax and upheld as constitutional without apportionment. Dixler, however, also notes that this “would surely test the meaning of direct tax” and require overruling some Supreme Court precedent. For another set of arguments that a wealth tax be upheld as constitutional (and not struck down as a “direct tax”), see Bruce Ackerman, “Taxation and the Constitution,” Columbia Law Review 99 (1999): 1-58.